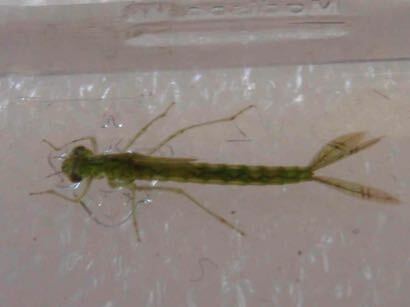 I developed this fly just after moving to Prince George in 2005 and use it routinely during the month of June to imitate migrating damselfly nymphs. I usually fish it with a floating line and long leader or a clear intermediate fly line. My retrieve is a medium paced figure eight retrieve, a pause for 5 seconds, and an occasional 4 inch strip. 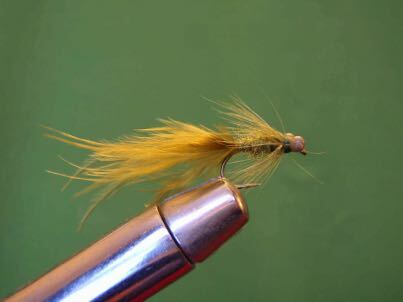 The key components of this fly are the short shank hook and the very long marabou tail that undulates and pulsates in the water. Some fly anglers might think that the tail is too long and that it results in a lot of short takes by fish. In my experience the takes are always very hard and I cannot remember ever experiencing short takes.